What’s the idea behind the Bonsai tree? How so? Curiosity was nearing the cat ready to strike. 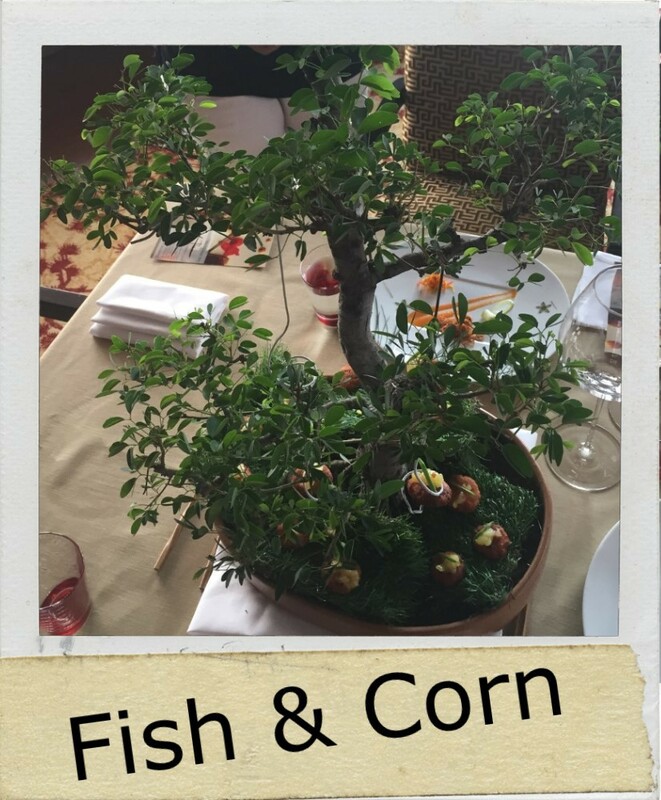 It’s Fish and you don’t find fish on trees, said Chef Vikramjit Roy about his first presentation of Fish & Corn that came dangling on a Bonsai tree. 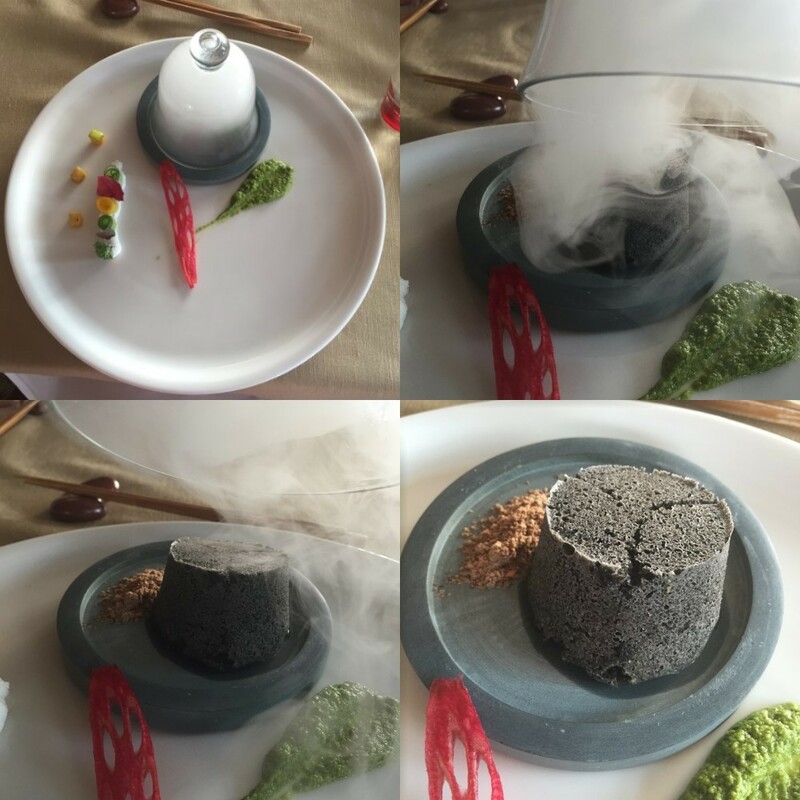 I had an instant liking for Chef Vikram because he said the very thing that I’ve been shouting about for quite a while now, that molecular gastronomy isn’t always and only about foam and smoke. 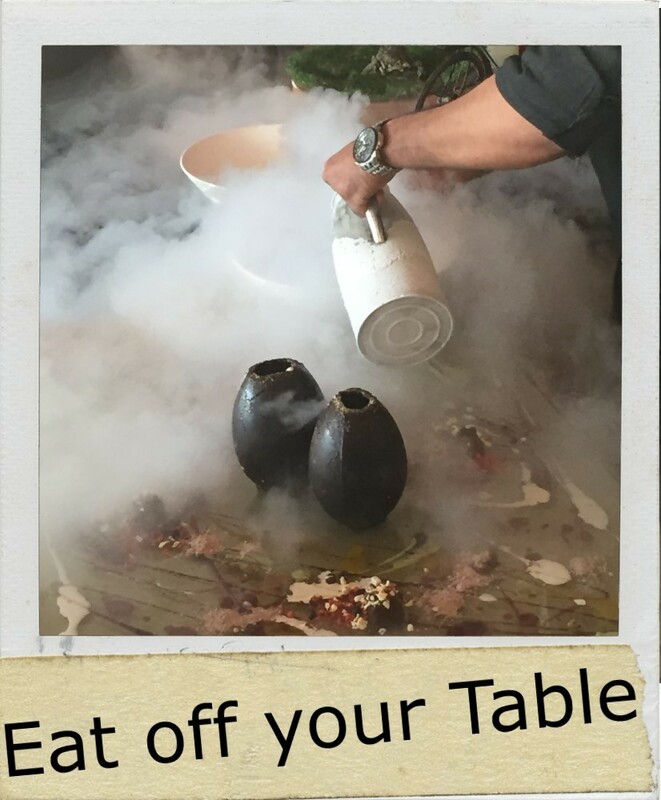 Liquid nitrogen is fun to play with and we got to see that too, but the fact that he doesn’t limit himself to just that is what makes his food spectacular. Take the mini Tacos that came in next, on pieces of paper (say what you may but it takes guts and confidence on part of the chef in a leading five star hotel of India to present food this way) that looked so cute I thought about adopting one and raising it till the time it became a full grown adult Taco. 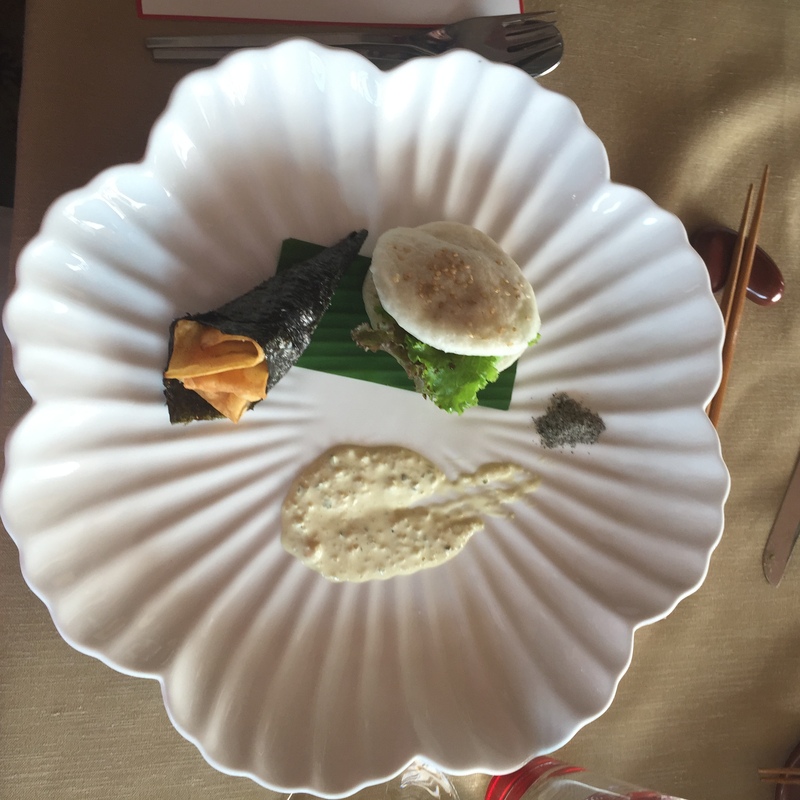 Mind you, the paper used to plate was from the magazine Brunch, and even though we were having “high tea” the atmosphere was very brunch-like, and this was another hint towards how much thought had gone into the minutest details of each presentation. While the vegetarian taco (yes, I cheated and tried both the vegetarian and non-vegetarian options) was reminiscent of a chaat you might find on the streets of Delhi with the right amount of sweet and sour Chatpata taste, the Pork Belly Taco makes the meat it’s champion. However, what stood out about the Pork Belly Taco was the little pump with the spicy sauce that added the fun component to the dish. Add to that the gluten free taco shells made with beetroot and what you get is a healthy, crunchy, meaty, mini, flavorsome delight. I do have to say that while Chef Vikram explained his various dishes and the complexities behind them, after a while it gets too overwhelming with the different levels of techniques and numerous ingredients that go into each aspect of the dish and its best to not think too much about what it is and just enjoy the food. Having said that, this was no less than a master class in the world of molecular food without doing any of the hard work and reaping in all the benefits. 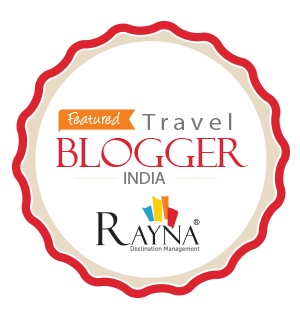 Let me back up a little here and talk about this tasting session at the relatively new (it’s not even a year old) Tian at ITC Maurya, New Delhi. 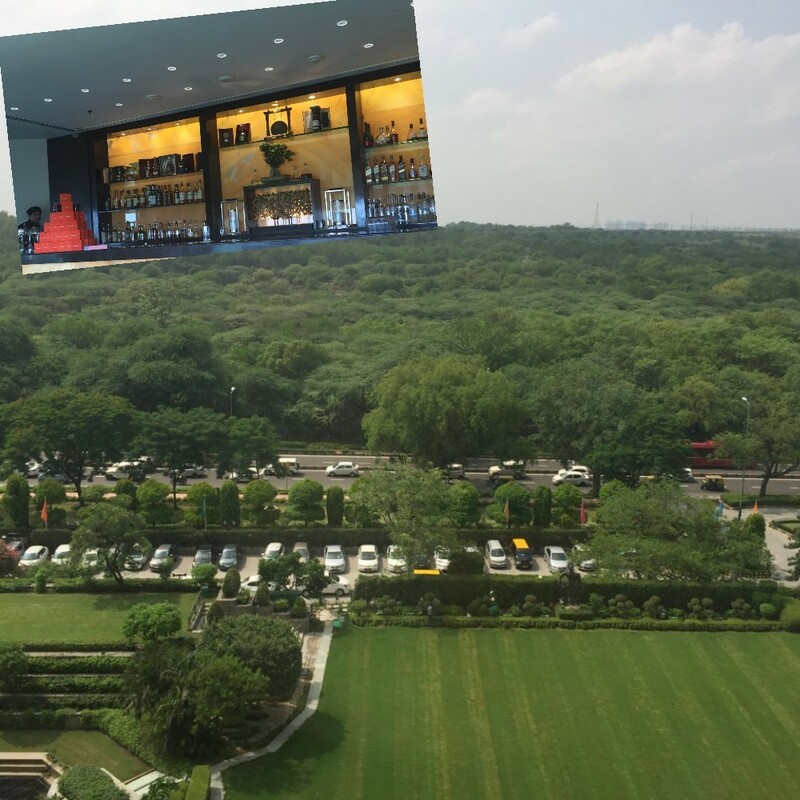 A competition win with Eazy Diner and Mr. Vir Sanghvi was all it took to descend (or should it be rise) to the roof top where Tian is located with views expanding towards the greenest portions of the city. It’s a perfect place to bring a date for a romantic dinner or have a meeting where your choice of location is bound to have a positive impression on your clients. While the outside, partially intimate, seating is stunning, and looked all-weather friendly, I found the decor of the main restaurant slightly old-fashioned. Now, it may serve well in contrast, a sort of Ying to the Yang, of the more modern food being served, but it certainly lacked spectacle. Whether this allows the food and the views to take precedence and will this work in the long run, I’ll let you decide. 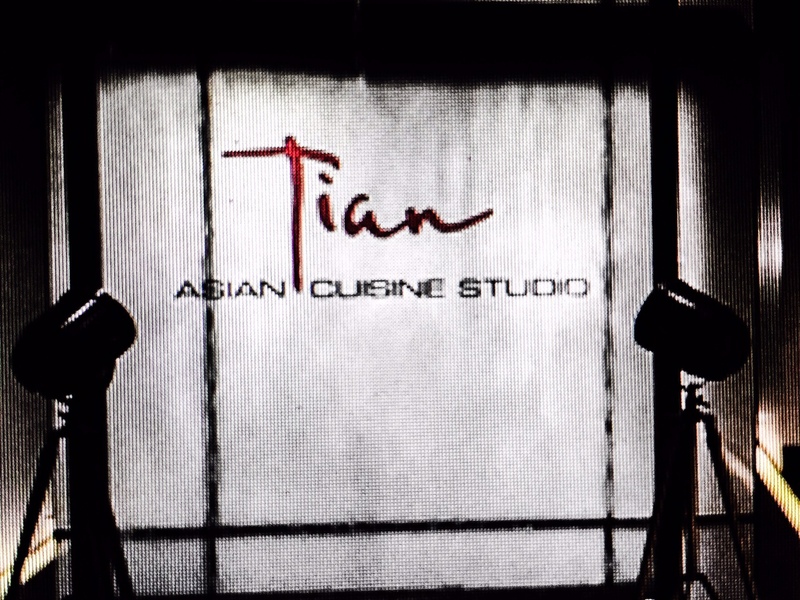 The service at Tian, and I’m aware this was a special event but I had enough time to get a good idea, was outstanding. Our server was knowledgeable about the food being served, very professional, and he even laughed at a joke I made (that’s like 2 brownie points right there). Even though this was my first time, there was a sense of familiarity and that kind of comforting feeling is hardly ever achieved in restaurants these days. 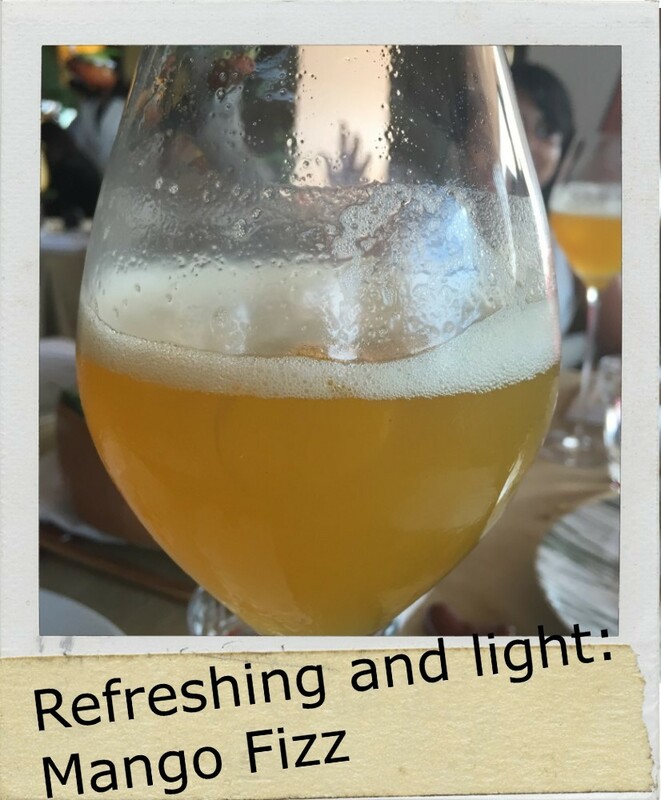 The idea behind the tasting is to not fill up on either any one dish or drink, and thus being mindful of this I held back on having more fish corn or the tacos and waited for the next course sipping away on a refreshingly light and breezy Mango drink specially made for the event. 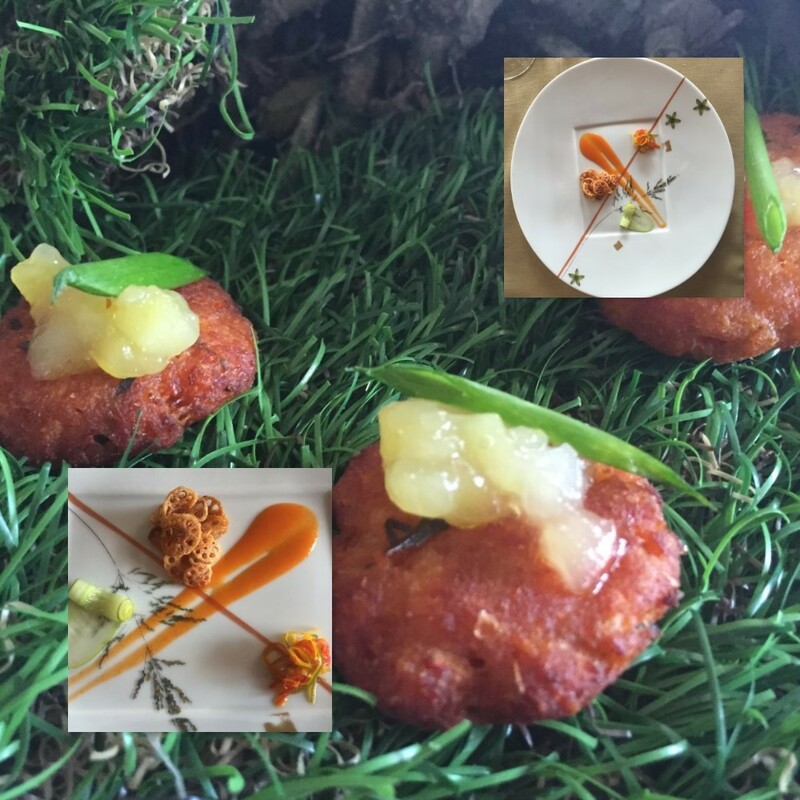 Returning to the food and it’s time for theater to take center-stage with the hickory smoked Scallop Micro Sponge. A plate with scarcely placed micro condiments, spicy chocolate sand on the side, and the drama begins with the arrival of a spoke filled glass cloche, its contents hidden. The unveiling starts with a whiff of hickory woody smell attacking the nostrils to reveal a dark sponge that has a hidden surprise of a well cooked soft scallop in its center (should food reviews also be spoiler free?). Who doesn’t like a bit of showmanship, it’s exciting, it’s entertaining, and best of all it is interacting. However, no matter the dazzling presentation, the sponge left me with a slight burnt after-taste that thankfully didn’t last long. The spicy chocolate sand (made with tapioca flowers, chocolate, Japanese chilly) and the other condiments were brilliantly placed and detailed to perfection. The Basil pesto like “chutney” proved to be the refreshing element that counteracted the darkness of the sponge. 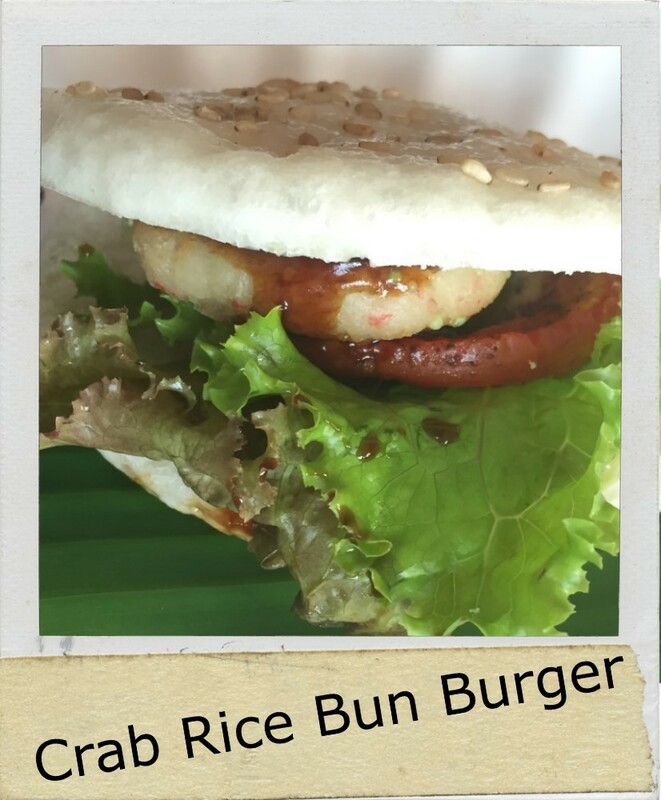 If the Scallop Micro Sponge left me a little bitter, the Crab Rice Bun Burger got me back in high spirits with its simplistic approach to the latest trend in Japan with added ingredients such as lettuce and tomatoes that made the burger familiar to what we are used to having normally. The juiciness of the patty and the softness of the bun along with the crunch of the non-fried spicy dehydrated sweet potato chips in a Nori cone and some tartar sauce to dip the burger in is what wet-food dreams are made of. What really elevated the dish to a whole new level was the seaweed salt that packs a strong punch by bringing the taste and smell of the ocean on to the palate. And then just look at that plate the food was served in and how its shell like design further compliments the entire seafood theme of the dish. I had barely recovered from the joy of the Rice Bun Burger when the first dessert arrived; Clouds & Rocks is a creamy crackling of a dish with so many textures and tastes. 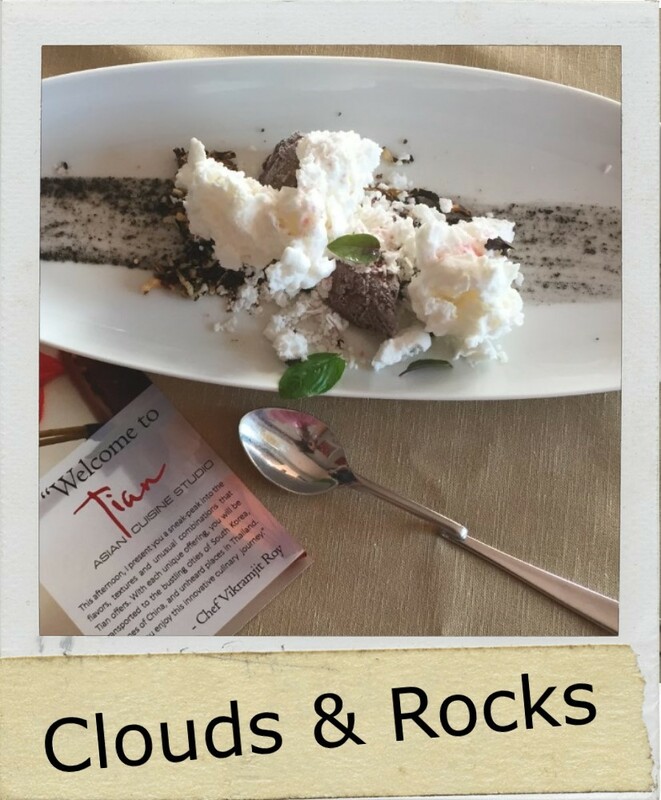 The puffed black rice gives the illusion of biting into rocks with its crunch and the dreamy White Godiva chocolate clouds (liquid nitrogen at play) melt from their “hard” form into a creamy soft puddle within a few seconds after being eaten. It’s a gleaming dessert, light and magical with so many different elements coming together in perfect unison. 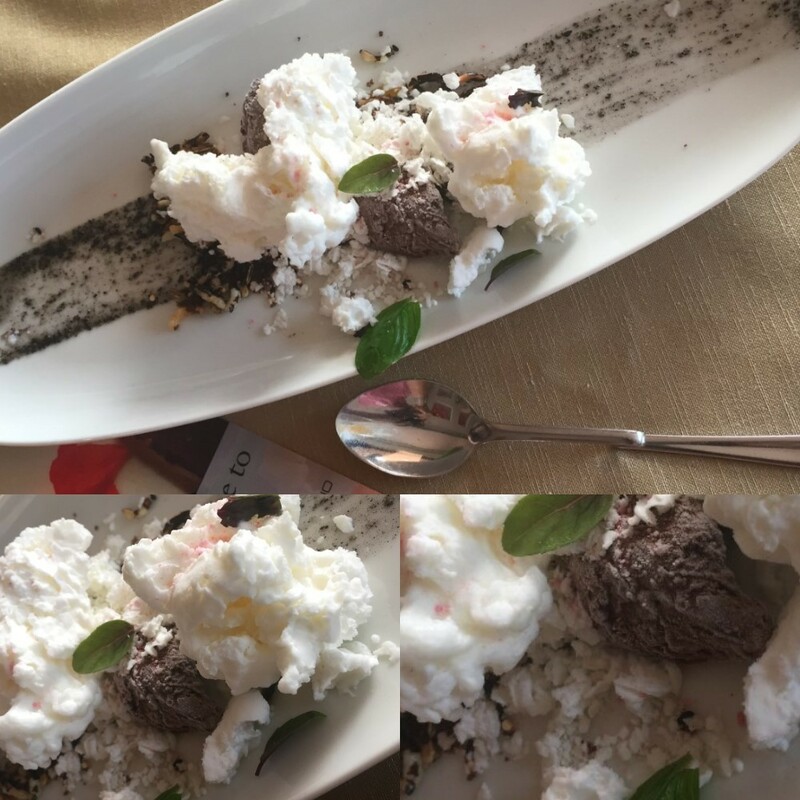 If the one dessert wasn’t enough, Chef Vikram then demonstrated the painstakingly intricate, although he makes it look like a piece of cake, Eat off your Table. Once again there’s grander in the presentation as he goes about adding one flavour after another on a glass table top and filling the four thick chocolate “vases” with foam only to have them lifted and dropped at the end. What results is the broken down chocolate mixing up with all the diverse elements guaranteeing an unusually unique taste with each bite. Throughout the evening I also managed to try three of the mocktails served (there were more but I held back). 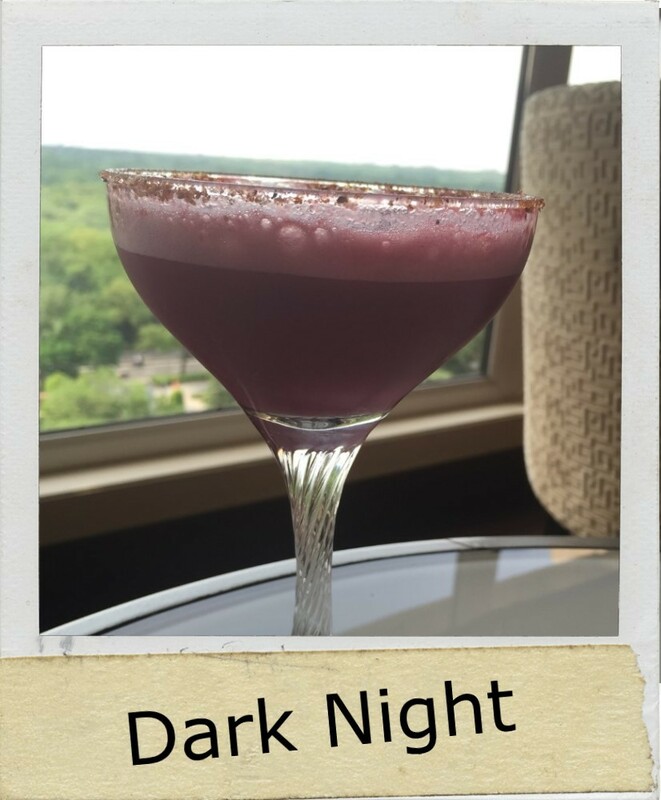 While the Dark Knight with a plum base tasted really good, it reminded me more of the Mixed Fruit juice that I grew up drinking at South Extention in Delhi. The Mango sparkling fizz worked skillfully with the meal adding a lightness to contrast the meats. 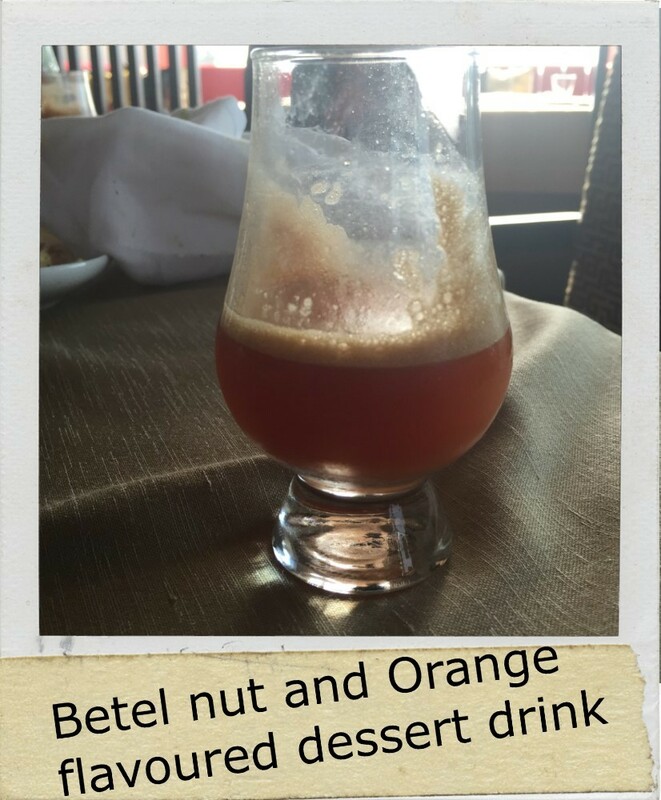 But it was the dessert drink, I don’t even know its name, with Betel nut and orange juice that was the perfect end to the meal with a lingering taste of a Paan without all the negative aspects of it. Tian is just not about the food. Chef Vikram is there to provide an experience for the guests and take them on a culinary journey through various parts of Asia. He takes his food seriously, even though I didn’t by demolishing what was on my plate acting like Godzilla. Still, I couldn’t help but notice the Chef run around full of nervousness and energy and passion, proud of the food that he was presenting. 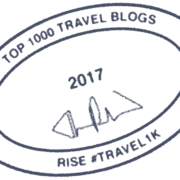 Many dishes might seem familiar, but they’ve all been modified, stamped by his uniqueness, worked on and offered in a fashion that encourages the guest to interrelate with the food they are eating. Another aspect that stands out about the food was that the Chef takes a lot of liberties to deceive you with the way his food looks (after all “looks can be deceiving” is something we’ve been taught since an early age); the Tacos that remind of Delhi ki Chat, the Dark Knight that is like a mixed Fruit juice, or even the Rice Bun Burger having flavours that are local, are all a play on the taste-buds, sight, and the mind, beautifully done in one dish after another. Lest not forget the colours, oh the myriad of colours, that each components bring to the plate makes the experience all the more delightful. To top it all, the Chef is careful about making this experience as healthy as possible by using rudimentary and favourable ingredients to create food which might usually be considered as unhealthy. 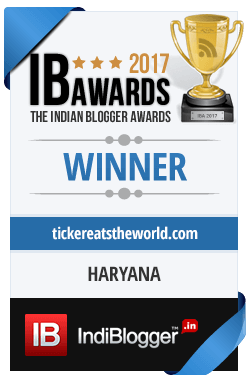 The moment you step into Tian and till the time you leave, be it the service, the food, the drinks, or the overall ambiance; everything amalgamates together magnificently to give you, the paying customer, an exemplary experience. Note: A special thanks to Eazy Diner for the competition and for picking me as one of the winners. 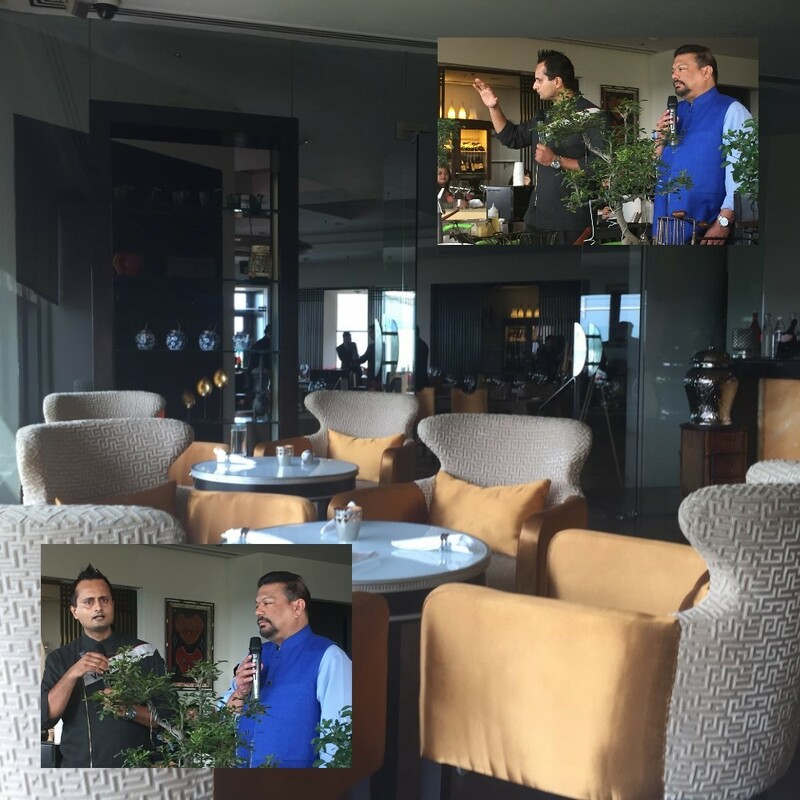 Mr. Vir Sanghvi was much more than the perfect host, humble to the core, giving us industry gossip, and explaining the intricacies of the food being served. Lastly, Chef Vikramjit Roy and his entire team for a captivating tasting that won’t be forgotten easily. PS: The above review has been written on my own accord. 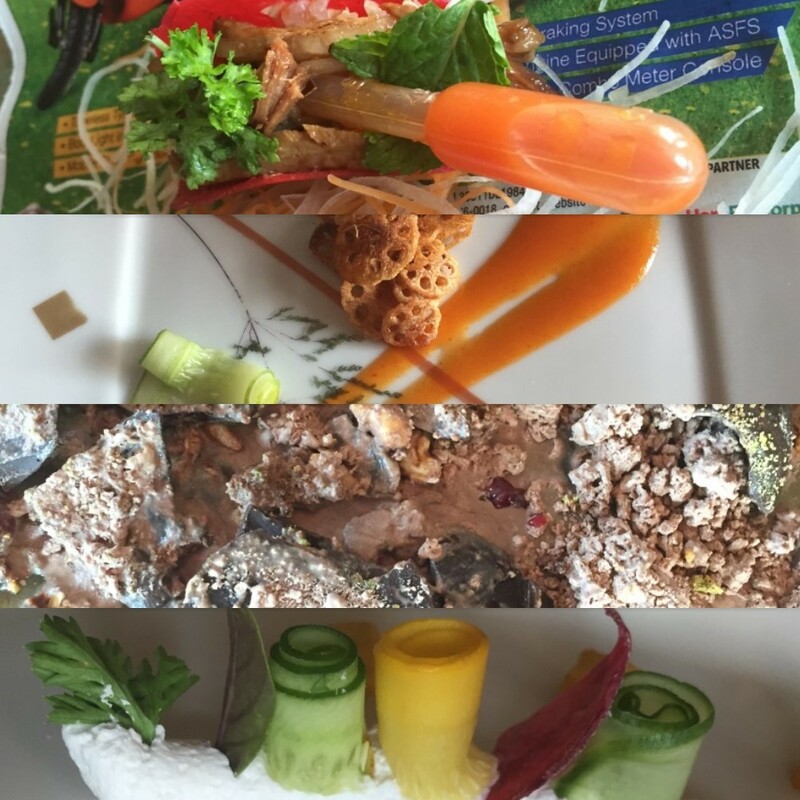 This cuisine is like a work of art and science combined! Did you get to eat everything? 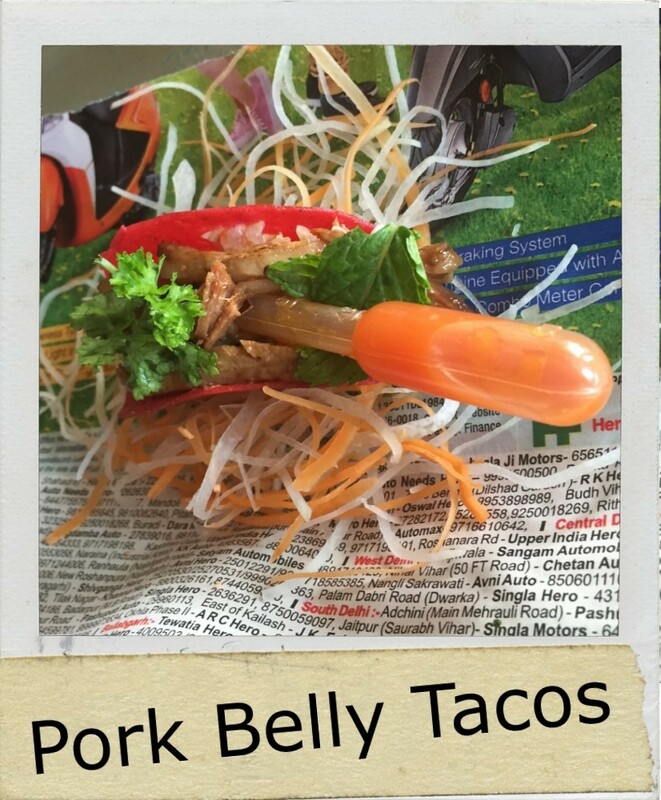 I like the sound of pork belly tacos, they sound divine. 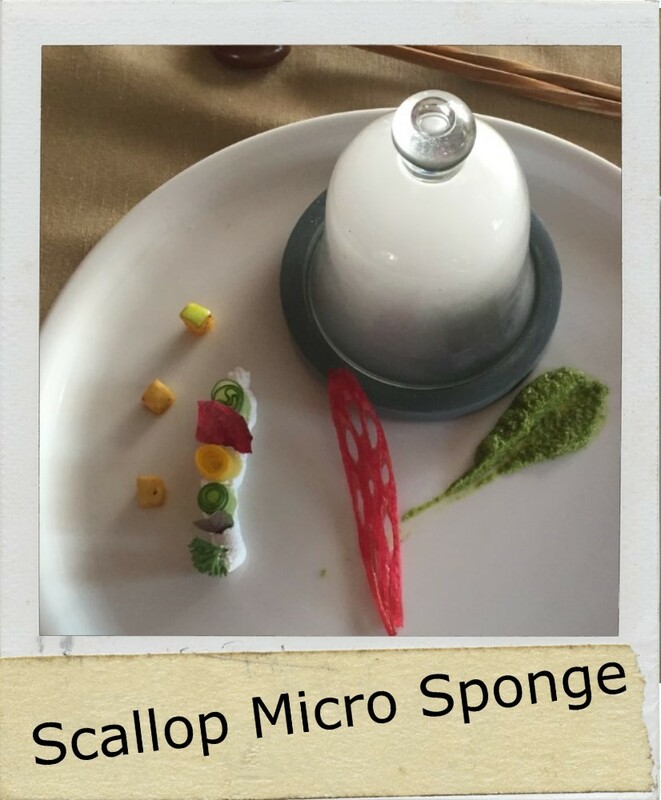 That scallop micro sponge looks a bit scary, but I’ll take your word it was good! You tasted some delicious looking food here. being British I am a fan of food being served on magazines (or newspapers). I like how the chef surprised you with how the dish looks and tastes. For the drinks, I’d go for mango fizz every time. India has the most delicious mangos. Looks like quite the food experience! I would love to do a big tasting like this, it looks like such a memorable way to enjoy the meal. 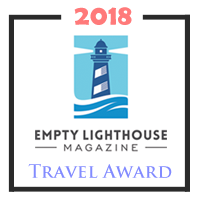 Congratulations on your prize–so glad you enjoyed it! I am feeling guilty for feeling so tempting towards this delicious looking food right now. I agree with the fact that to food that looks delicious tends out to be delicious(90%) 😀 All these savory and specially the dessert looks really awesome, eat off the table 😀 Love it, I’m going to give Tian a try for sure!! Thanks for a great recommendation! Tian looks combination of culinary skills with science. Mango fizz looks appealing to me as must be presented with some twist in this hotel. As I am vegetarian, hopefully they have something unique inventory dishes for me too. You have taken nice shots of all dishes. That food looks like something out of a science lab. Very interesting concept here, I would love to try all of the food and drinks. My palate is very all over the place so I think the tacos and the dark Knight drink would be the best.